The Samsung Galaxy Express represents an interesting mix of features. 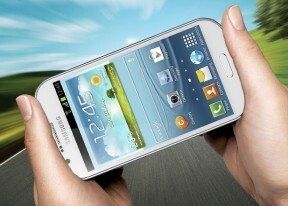 The latest Jelly Bean flavor, the impressively fast processor, the LTE connectivity, the spectacular 4.5-inch Super AMOLED Plus screen, and the Galaxy S III looks are all attention-grabbers. Yet, the Galaxy Express only offers a 5MP camera with 720p video and the screen is only of WVGA resolution. As usual, unless you go for the flagship, it's always a question of compromises in the midrange and the Galaxy Express is yet another mix of gives and takes, which would hopefully satisfy a good part of the consumers. Ever since Qualcomm's dual-core Krait made its debut on the HTC One S, it has been making the headlines with its top-notch performance at a decidedly more affordable price point. While other chipsets have since narrowed the performance margin, the Krait architecture continues to be one of the most successful chipsets around, particularly in the dual-core arena. However, despite its proven track record, Krait-powered Android Galaxy smartphones are as rare to find as two-headed snakes, especially outside the US. Samsung released an AT&T variant of the Express this past November, which is part of a growing family dual-core Krait devices available for the US market. The included Jelly Bean update makes the Galaxy Express I8730 a bit more than a simple rehash of the AT&T's version, which is still stuck on Ice Cream Sandwich. We also shouldn't forget AT&T's propensity to include a good amount of carrier bloatware in the form of preinstalled apps and services, which bring down the user-available storage in the US version from 8GB to 5GB. And although the dual-core Krait in the I8730 is downclocked to 1.2GHz (compared to 1.5GHz on the I437 Express for AT&T), the updated Android experience should still provide you with a better out of box experience than what you'd find Stateside. Plus, the lower CPU clock will certainly go easier on the battery. Anyway, we'll go more in-depth with what you can expect from software point of view a bit further in our review. Up next, we'll get started with our usual hardware tour.